At Indiana Jones Adventure at Disneyland, you're going straight into the world of archaeology and intrigue from the popular films. The year is 1935. As a rider, you are a tourist visiting the Temple of the Forbidden Eye. You take off in "jungle transport" vehicles which look like rugged jeeps. In reality, they are moving motion-simulators with onboard sound. The vehicle bounces, stutters, stops and starts. You'll encounter snakes and people shooting arrows - and those awful bugs. You'll see Indy, but he won't be much help. Whatever you do, don't look into the idol's eyes. 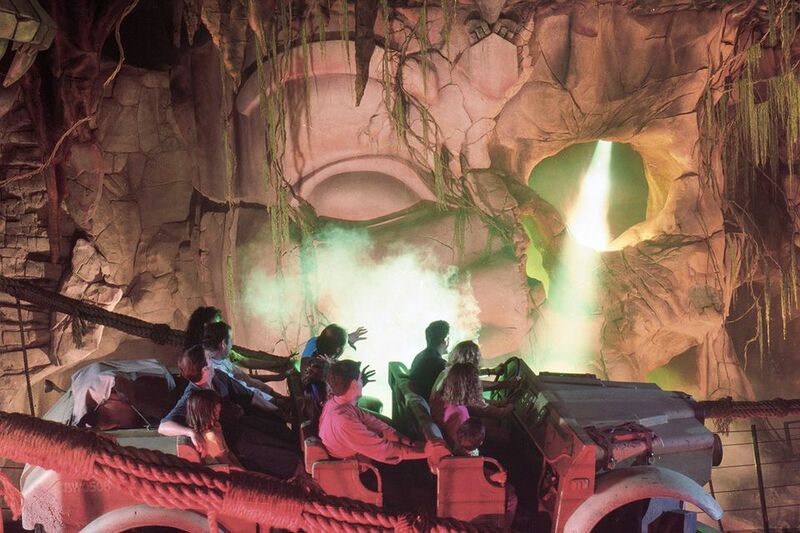 Variations make every Indiana Jones Adventure journey unique: In theory, you could ride it 160,000 times and never experience the same thing twice. Location: Indiana Jones Adventure is in Adventureland. Restrictions: 46 inches (117cm). Regardless of height, children under age 7 years must be accompanied by a person age 14 years or older. Fun factor: High. In fact, Indy is one of the best rides at Disneyland. Wait factor: High. Use a Fastpass to shorten your time in line, or try getting in line during the parades or evening shows. Fear factor: There's a lot of excitement as you careen from one near-disaster to the next. As Indy would say: "Why do there have to be snakes?" Herky-jerky factor: This ride is not for anyone a neck or back trouble, heart problems or for expectant mothers. Seating: Ride vehicles look like a big Jeep or a Hummer that holds twelve people in three rows. Each rider has a seat belt. The left front seat has a steering wheel, but it's non-operational. To board, you step straight in. Accessibility: If you use a wheelchair, enter through the EXIT and go to the waiting area, where a cast member will help you. You will have to transfer from your wheelchair into the ride vehicle. At City Hall, you can get Closed Caption equipment for selected portions of this ride. Indiana Jones Adventure rates high for excitement and can be quite startling as you hurtle along through the dark. 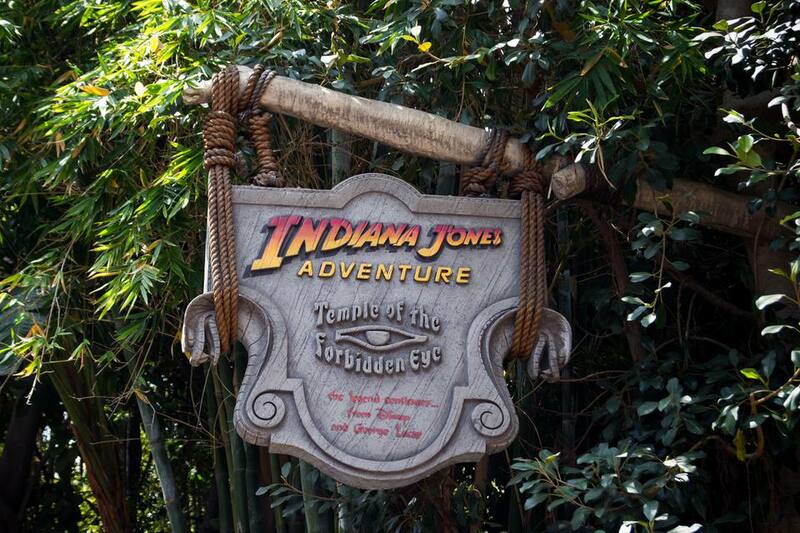 Indiana Jones has a Single Rider option that may help you get on faster. Cast Members use single riders to fill in otherwise empty seats. If you're willing to split up from the rest of your group while riding, it can shorten your wait time significantly. The entry walkway for this ride is long. If the sign outside says the wait time is 15 minutes or less, you'll spend most of those minutes just getting to the boarding area. In the projector room, there's a hidden Eeyore near the ceiling. Ask a cast member to show it to you because you probably won't find it by yourself, up in the corner in the dark. Why Eeyore? Because the ride was built where the Eeyore parking lot once was. The line at Indiana Jones Adventure is one of the longest at Disneyland (up to 2 hours on a busy summer afternoon), but the designers worked hard to make the wait a pleasant one. Messages in hieroglyphics decorate the indoor area. These "Maraglyphics" can be translated into English using a simple code. When you reach the room with spikes on the ceiling, pull (hard) on the bamboo pole on the left side, and it will seem like the ceiling is falling. In fact, this ride's queue is a chance for some creative disobedience. Pull on anything with a sign that warns you not to and something will likely happen. The original troop transport vehicle used in the film "Raiders of the Lost Ark" sits just outside the entrance of this ride.